Sunday morning Mike and I drove up Rte. 180 to the south rim of the Grand Canyon. This is our story. We managed to snag last minute reservations for a room within the Grand Canyon National Park at Maswik Lodge, which turned out to be a basic but serviceable room about 1/4 mile from the rim. Our room was available for us when we arrived about 1:00 p.m., so we unloaded our gear, and prepared to experience the wonders of the Canyon. 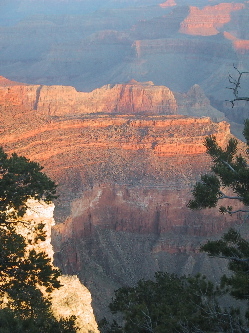 Over the afternoon we wended our way west along the Canyon rim. We both remarked at how non-commercialized the Park was, and how fear of litigation didn’t seem to have effected the Park planners, as there were no large fences — or really anything — separating visitors from the edge of the Canyon (which may explain why Over the Edge: Death in Grand Canyon was tagged “Our Best Seller!” in the hotel gift shop). We had a fantastic dinner on the Canyon edge, and retired early to bed so as to be able to get up at sunrise (aided somewhat by a bottle of red wine which appeared to double its usual effects at the high elevation). Note to self: in future, do not walk near the Canyon wall after drinking half a bottle of wine. This morning, mostly due to Mike’s energy and urging, and despite a freak occurrence of Piano Man by Billy Joel played on a car stereo at incredible volume at 1:30 a.m. in the hotel parking lot, we rose at 5:30 a.m. and hurried to Yavapai Observation Station to watch the sun rise. I took a whole host of photos, and was amazed at the different quality of the Canyon at that hour, with the angle of the sun making all of the reds redder and the oranges oranger. It was truly an amazing site, and if you visit Grand Canyon, your visit will not be complete unless you follow suit. After some recovery time, and a breakfast (in the surprisingly complete, inexpensive, and spacious cafeteria at Maswik Lodge), we got in the car and headed east towards Santa Fe. We decided to take the somewhat longer route along Rte. 64 to Desert View, then through Cameron, Tuba City, down through Hopi and Navajo country, and up through Albuquerque. While it was a long day of driving, the scenery was stellar — everything from flat, endless dessert to towering mountains and red cliffs. We arrived here in Santa Fe around 10:30 p.m., and will be around and about this city tomorrow. Mike is daunted by the prospect of re-encountering snow in Denver, where it has been snowing this week, so we might hang here longer, and breeze up to Denver on Wednesday. Time to sleep; looking forward to ambling around Santa Fe tomorrow, with the volume turned down to 3 or 4 for a chance. Written April 13, 2004 at 2:13 a.m.